Regardless of your heritage or survival experience, the zombie apocalypse will strike without prejudice. 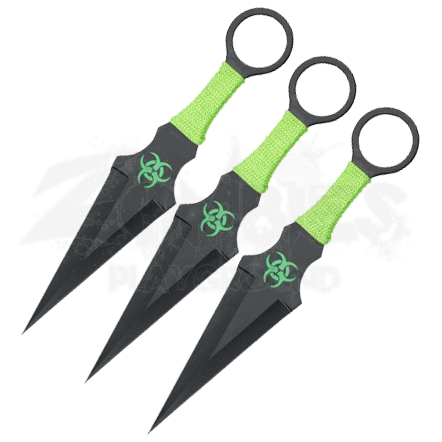 Be prepared to protect yourself and your loved ones by arming yourself with the 3 Piece Biohazard Hidden Strike Throwing Knives! Crafted from blackened 440 stainless steel, this trio of throwing knives reimagines the kunai from ninjutsu into a weapon every apocalyptic survivor can utilize. The silhouette largely remains the same, staying true to the expert build that will fly through the air and strike your intended target with a satisfying thud. To remind all who wield these deadly throwing knives, a vibrant green biohazard symbol is carved into the center of balance on each knife. Bright green nylon cord wraps around the slender handle for when throwing the knives isnt an option, allowing for a comfortable grip when you need it the most. Stow this three piece set away in the rugged nylon sheath for convenient storage at your fingertips to be armed even at your most vulnerable moment! Zombies will not care if you are experienced at surviving or not, so be sure to grab the 3 Piece Biohazard Hidden Strike Throwing Knives and prepare for the coming horde!